Unidentified woman was relaxed when she boarded the plane, not expecting her baby to be born. A Filipina disembarked from a plane in unexpected situation, having given birth to her daughter during mid-air flight from Dammam Saudi Arabia to Philippines. A photos of a woman giving birth inside the plane have gone viral online, praising the flight crews for helping out the woman and the baby's safe delivery. 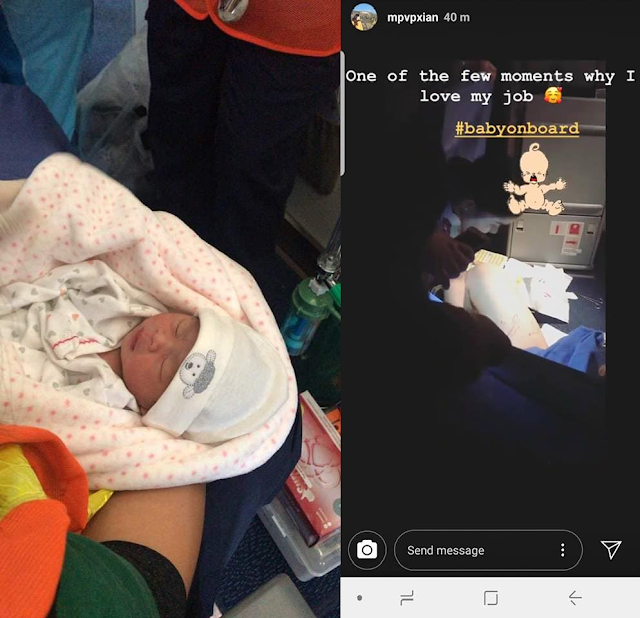 In a Facebook account of Paulo Infante, a Philippine Airlines employee said that the flight attendant Marigold Parreño assisted in labor during PR 683(DMM to MNL) and successfully helped her deliver a healthy baby girl four hours before the plane landed in Manila. Parreño as a former nurse and has a background doesn't hesitate to helped the mother. The airline have been always preparing medical equipment onboard especially in case of emergency, she said to GMA news. "Mabilis yung pangyayari kaya kung ano lang yung instinct mo to help the mom and the baby ginawa ko na lang po," she added. As of the posting the post generated more than 2K shares and more than 5K reactions.